Is Steve Mnuchin Lobbying The Fed To Halt Rate Hikes? Since President Trump first complained that Fed was "out of control" and "crazy" for insisting on raising interest rates, more Wall Street luminaries and senior administration officials have begrudgingly admitted that President Trump's attacks on the central bank (in addition to bashing the central bank for hiking rates, saying he's "not even a little bit happy" with Fed Chair Powell, Trump said in an interview published last night that he's displeased with its balance sheet unwind) might be justified in breaking with decades of precedent - or at least they understand that the president was simply trying to avoid becoming the "fall guy" for a decade of QE lunacy. And with his job increasingly threatened by the unremitting selloff in US stocks, which President Trump regards as the most important barometer of his performance, Treasury Secretary Steven Mnuchin has apparently decided to try and do something about it. In an Oct. 30 meeting with a Treasury advisory committee that makes recommendations to the government quarterly on its debt sales, Mnuchin asked which they favored -- an accelerated balance sheet run-down or further rate hikes -- if they had to choose one or the other, according to the six people, who asked not to be identified because the conversation was private. One of the people said that Mnuchin asked the question out of curiosity of what bond market participants thought of the two alternatives before the Fed. Mnuchin raised the question during a regularly scheduled quarterly meeting with the Treasury Borrowing Advisory Committee, or TBAC, which includes representatives from investment funds and banks. Its members include executives from Goldman Sachs Group Inc., Citadel LLC and JPMorgan Chase & Co. The TBAC provides the secretary a chance to engage with bond market participants to help inform debt management plans, a Treasury spokesman said, declining to elaborate further. 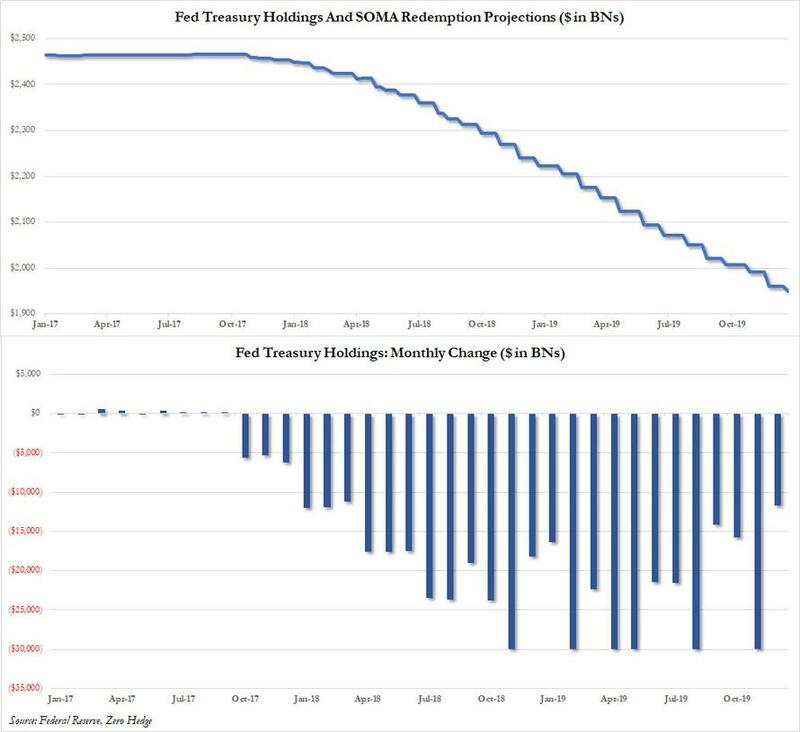 But ultimately, whether the Fed continues with 3-4 rate hikes next year, or chooses to pull back further on its reinvestment of Treasuries and MBS as they roll off its balance sheet, when it comes to maintaining market stability, neither option looks particularly attractive, especially since many believe the tightening impact from the balance sheet rolloff is even higher than from rate hikes alone. 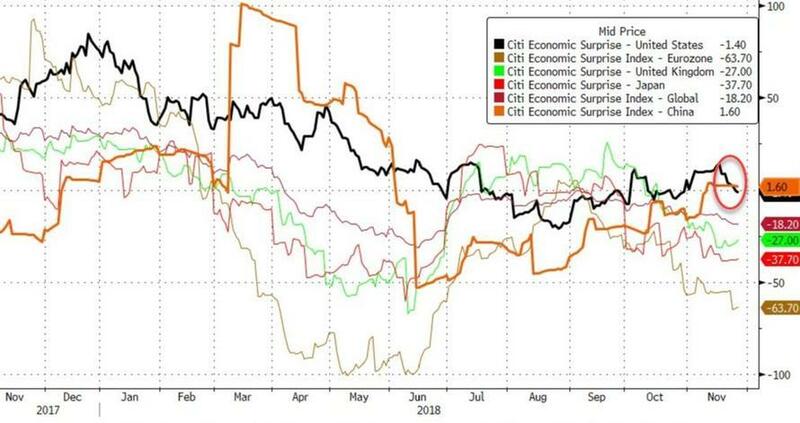 While rate hikes have been blamed by Wall Street and the president for pushing stocks into correction territory, the less-popular narrative of balance sheet runoff is also driving tighter financial conditions as the tide that lifted all assets during the recovery is finally going out. Just look at a chart of the 10-year yield compared with the balance sheet runoff. With the Fed entering 'peak unwind' of its balance sheet, the central bank is more than offsetting the bid from corporate buybacks. 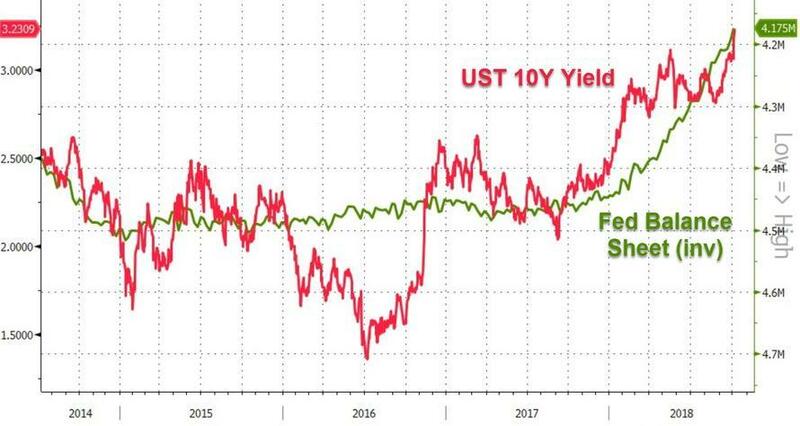 ...accelerating the unwind would risk a destabilizing spike in Treasury yields that could topple stocks and high-yield credit alike, further depressing economic growth. Of course, if Trump knew what was good for him, he'd know that he'd be better off not saying anything, and instead allowing the Fed to undertake the course correction necessary to ensure that it continues to protect its unofficial "third mandate" on its own terms - because bashing the central bank only risks painting it into a corner as policy makers are forced to worry about saving face to preserve the central bank's "credibility." Already, Powell and Fed Vice Chairman Richard Clarida have started laying out a case for slowing rate hikes in 2019 as soon as it became clear that the selloff wasn't letting up. But this signaling has been largely implicit. Because, as many seasoned Fed watchers understand, the first rule of the "third mandate" is you don't talk about the "third mandate." Finally, if Trump really wants the Fed to stop raising rates or perhaps even cut and launch another round of QE, all Trump needs to do is "ensure" that the US economy suffered a sharp, but brief, slump. In the long-run, with 2020 looming, Trump would be far better served to have this occur sooner, when the Fed's change in monetary policy will have time to affect markets and the economy, than wait and suffer a recession just ahead of the next presidential election.